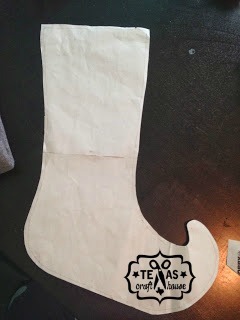 I pinned the pattern to my felt and had the felt doubled over so that when I cut, both front and back pieces to the stocking would be cut out at the same time. 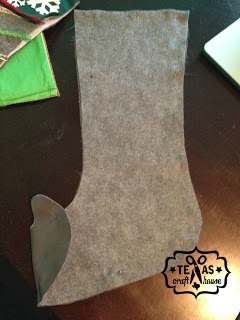 I only cut one stocking shape of batting for the front side of the stocking. Then I cut two more pieces of the fabric I used as lining. 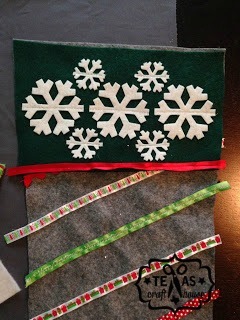 Then I laid out my ribbons and pinned each one down to the front side of the felt for the stocking. When I sewed the ribbons on I matched the threads I used to each ribbon so it wouldn’t be noticeable. My next addition is the top portion of the stocking, let’s call it a bib (I can’t for the life of me think of what it should be called!) A few years ago I found the cutest Christmas ribbon that had shapes and beads attached to them, I had no luck finding these this year so I went with a satin accent ribbon instead. I folded over the bottom of the bib and pinned the red ribbon onto it. I sewed right across with red thread with no concern for the edges as the will get sewn over in the end. Then it came to figuring out what design I would put on the bib. As you can see from my original stockings above I didn’t repeat anything. With that in mind I thought of many different things I could do to stick with the original theme, because I don’t want it to be too obvious that I made this stocking years later. I decided to go with snowflakes again, but in a different pattern. 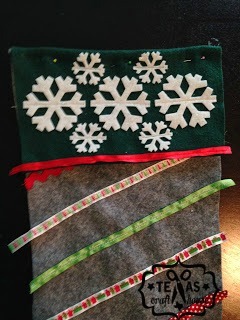 The snowflake felt pieces I had were actually sticky on the back so I stuck them onto the stocking and then sewed through the middle of them in order to make sure they would stand up to the test of time. 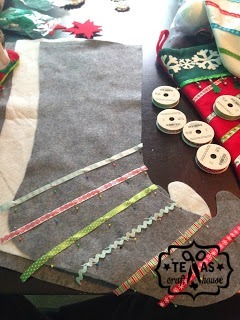 When it came time for me to sew the bib onto the stocking I had to think further ahead in the project. 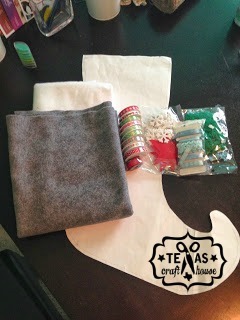 Lay out all of the pieces to the front of your stocking as if the stocking were completed. So put down your lining, followed by the batting and then the front of your stocking. Go ahead and pin this all together because this will help later on. Now to attach the bib you must do the right side of the bib to the wrong side of the stocking. 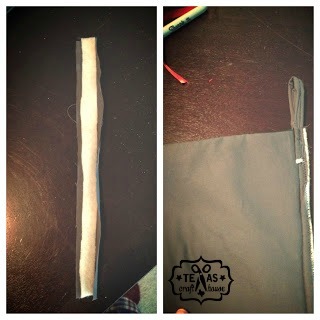 Sew only across the top with a 1/4″ hem. I went ahead and did a zig-zag stitch over the edges to keep from fraying. 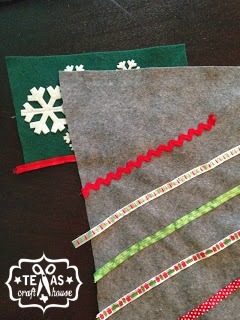 Flip over the bib portion and it should now look like what the completed front of your stocking will be. 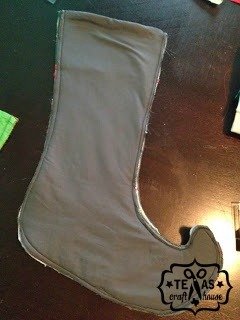 The same thing will now have to be done to the back of the stocking with the felt and the lining. Before sewing the stocking the together we must stitch the top of the stocking where the opening will be. Work backwards if it’s confusing. 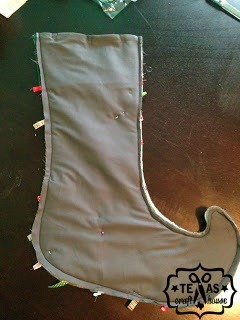 I laid out the stocking how it was supposed to look once sewn and then flipped the fabric over to sew with a 1/4″ hem. Then I pinned the two layers together. The next step is to sew the two pinned sections together. Be careful not to get pricked, sew 1/4″ around the entire thing. 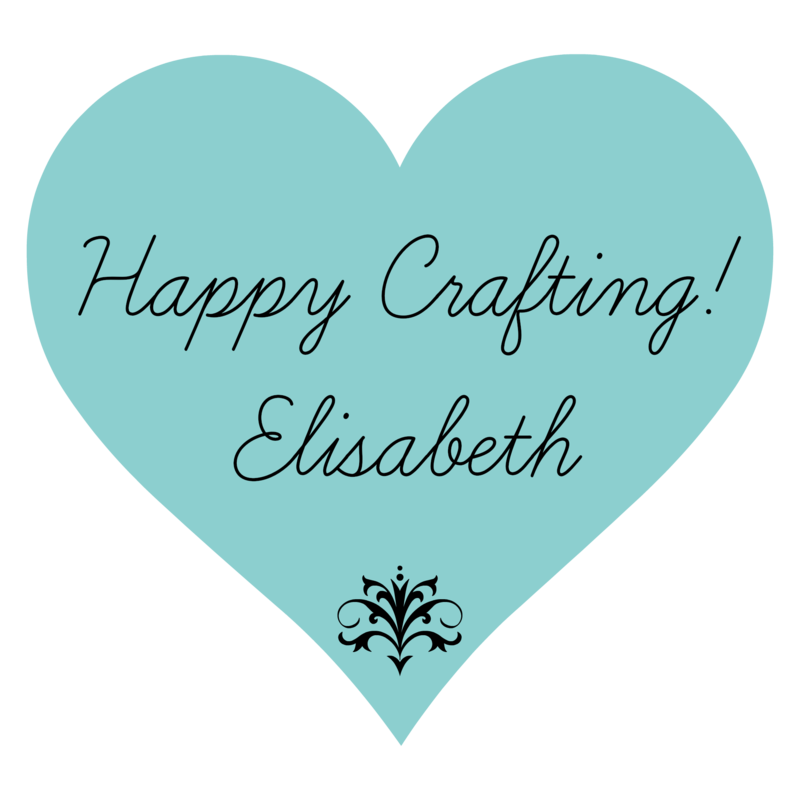 I kept my stitch within the grey lining because it was a little smaller than the felt that had gotten stretched out while I worked with it. Pin in a couple of places and sew! I also zig-zagged all the way around. For the hook that the stocking hangs from I just took some of the left over fabric and a strip of batting, folded over to cover the seam and then sewed it onto the inside of the stocking. Now flip your stocking right side out and attach the jingle bell at the bottom. 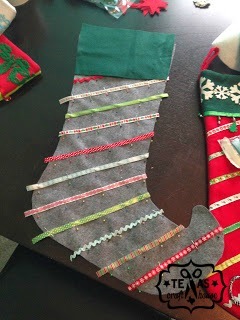 You may end up with areas of our stocking that didn’t catch so there is no stitch and an opening. To fix this turn your stocking back inside out and sew further in to ensure you are catching all of the layers of fabric. Worst case you have to do this a couple of times before it’s done. Voila! You can’t even tell I didn’t make them all at the same time! 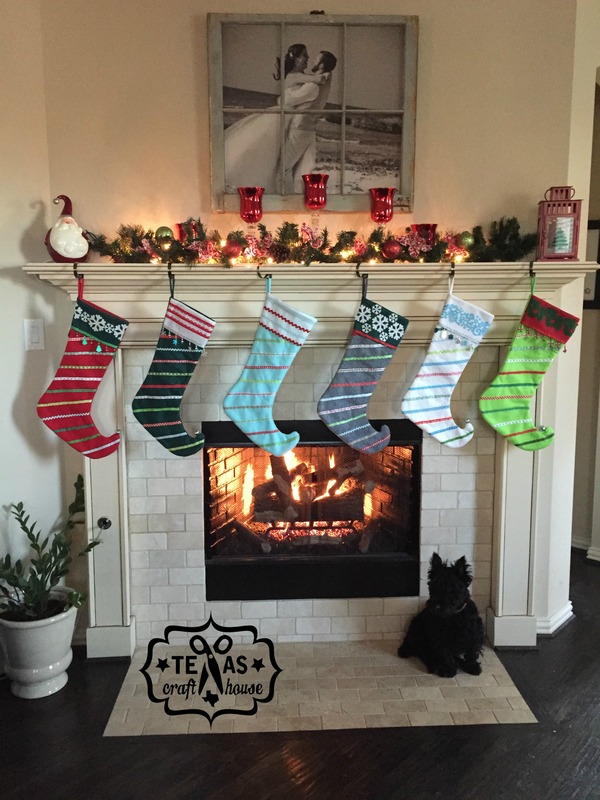 I’m thinking about making these stockings and some other designs to sell, what do you think? Love this! Merry (early) Christmas! 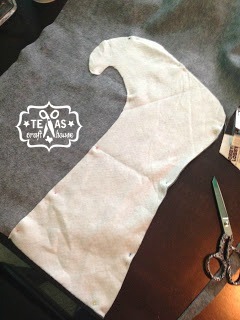 Reblogged this on Texas Craft House.